Fallon, Nevada’s newest full-service dentist office. At Nevada Dental Arts, we provide comprehensive dental services for the entire family including restorative, cosmetic, pediatric, preventative and sedation dentistry. We’re committed to helping you improve and maintain both your smile and your health in a relaxed, comfortable environment. 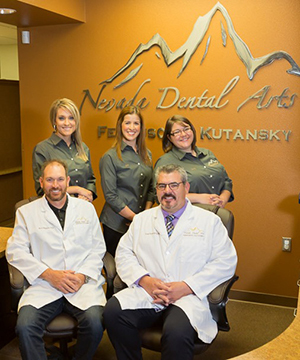 Centrally located in the growing west side of Fallon, the Nevada Dental Arts team is lead by dentists, Jason Ferguson, DDS and Tomas Kutansky, DDS. Nevada Dental Arts holds special credentialing and is one of the only offices in Fallon to offer IV sedation. This means our patients can receive needed oral surgery, such as wisdom tooth extractions, implants and pre-prosthetic treatment—all close to home, right here in Fallon. Additionally, our caring, supportive team of registered hygienists and dental assistants are here to provide you and your family with effective, yet gentle, preventative care including cleanings, x-rays and instruction. Regular dental check-ups and cleanings can improve your overall health. In fact, good oral health can positively impact other health problems such as heart disease and diabetes. Now that’s something to smile about! Nevada Dental Arts takes great pride in delivering the most technologically advanced dental care in Churchill County. We welcome you to discover more about our equipment, dental services and our team.